This advisory circular contains acceptable methods for testing altimeters and static systems. It also provides general information concerning the test equipment used and precautions to be taken when performing such tests. Certain aircraft are required by Section 91.170 of the FAR to have altimeter and static system tests. These tests are described in Appendix E of Part 43 of the FAR. Equipment, materials, and required tests for test equipment are specified in Section 145.47 of the FAR. Persons authorized to perform altimeter and static systems tests are identified in Section 91.170 of the FAR. a. Visually inspect the ports, plumbing, accessories, and instruments connected to the static system and repair or replace those parts which are defective; such as, broken "B" nuts, cracked flare sleeves, deteriorated flexible tubing, bad valves, etc. Purge the system, if necessary, to remove foreign matter which may have accumulated in the tubing. b. Check the static port heater to assure proper operation by noting either ammeter current or that the pitot tube or static port gets hot to the touch. c. When an aircraft has more than one static system, test each system separately to assure their independence and to assure that the leak rate for each system is within tolerance. d. Connect the test equipment directly to the static ports, if practicable. Otherwise, connect to a static system drain or tee connection and seal off the static ports. If the test equipment is connected to the static system at any point other than the static port, it should be made at a point where the connection may be readily inspected for system integrity after the system is returned to its normal configuration. Remove all static port seals after completion of the static system test. e. For unpressurized airplanes, conduct the static pressure system proof test to the standards prescribed in FAR Part 23.1325(b)(2)(i) or Part 25.1325(c)(2)(i), as applicable (see paragraph 9 for precautions). f. For pressurized airplanes, conduct the static pressure system proof test to the standards prescribed in FAR Part 23.1325(b)(2)(ii) or Part 25.1325(c)(2)(ii), as applicable (see paragraph 9 for precautions). (1) An accurate vacuum gauge referenced to atmospheric pressure and connected to the static pressure system may be used to measure the equivalent cabin differential pressure. STEP 4. The test pressure expressed in inches of mercury can be converted to test altitude using Table IV GEOPOTENTIAL ALTITUDE, ENGLISH UNITS, contained in the document titled "U.S. Standard Atmosphere, 1976 (Stock No. 003-017-00323-0)," which is available from Superintendent of Documents, U.S. Government Printing Office, Washington, D.C. 20402 at a cost of $6.20. a. The static leak test should be conducted first to assure that there are no static system leaks to influence altimeter indications. b. Permit the altimeter to stabilize after a flight before performing the test. c. Use portable test equipment or barometric test equipment as described in paragraph 7, Altimeter Test Equipment. d. When vibration is applied to the instrument, assure that it is not of a magnitude which will mask a sticky altimeter. a. Mercurial barometers with accuracies specified in and maintained in accordance with Advisory Circular 43-2A. (ii) An altimeter (with appropriate correction card) which has been calibrated, within the past thirty days, against a barometer described in 7a. (2) Each day the equipment should be checked for accuracy at station pressure using an aneroid or mercurial barometer. If the equipment is not used daily, a "before use" test may be substituted for the daily test. (3) The thirty day calibration period in (1) may be extended provided the calibration records of the individual test equipment reflect continued accuracy. (1) EXAMPLE: I certify that the altimeter and static system tests required by FAR Part 91.170 have been performed. The altimeter was tested to __________ feet on [date of altimeter test]. 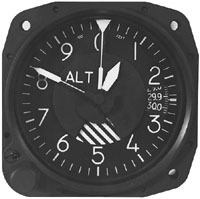 (2) The date of the actual altimeter test and maximum altitude to which the altimeter was tested should be recorded on the altimeter by the person making the altimeter test. This section contains information about precautions that can be taken to avoid damage to sensitive instruments that are connected to static systems during static system tests. a. Before any static system is tested, it should be determined that the design limits of instruments attached to it will not be exceeded during test. To determine this, it is necessary to locate and identify all instruments attached to the system. 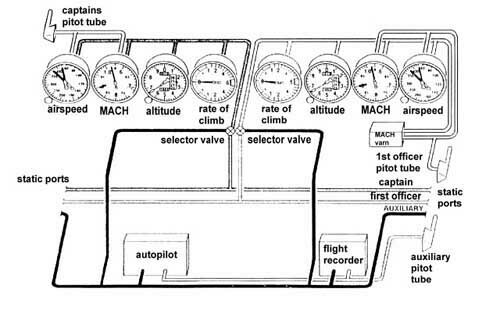 In addition to the altimeter, airspeed, and rate-of-climb, many airplanes use static pressure for the operation of autopilots, flight recorders, air data computers, altitude reporting digitizers, etc. The use of a static system diagram of the airplane involved may be helpful in locating all of the instruments. If a diagram is not available, the instruments can be located by tracing the physical installation. b. Damage can occur to instruments that are connected to both the static system and pitot system when only the static system is evacuated. The maximum design differential pressure of these instruments may be exceeded. One method to prevent this type of damage is to tie both the pitot and static systems together when conducting static system checks. This should result in zero differential pressure regardless of the degree of static system evacuation. It should be noted that a leak in either system will be indicated on the test set. c. Safeguards should be taken to prevent accidental disconnection of the test equipment plumbing from the aircraft or the test equipment while the static system is evacuated. The resultant sudden pressure change may damage both the test instruments and the aircraft instruments. (1) Disconnect all instruments and air data sensors. (2) Cap off those lines not being purged. (3) Restrain hoses which can whip due to purge pressure. (4) Assure that lines are clear by feeling discharge pressure at ports. (5) Clean system drains and traps after purging since they can act as a sump for foreign material.